My sixth grade reading students reading to a fourth grader. Another quarter is coming to an end at St. Joseph’s Indian School; the year is going by fast! In my reading classes, we have wrapped up the units on nonfiction and have ventured in to the world of poetry. 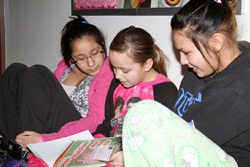 It is a nice change for the Lakota students because they are introduced to not only serious poetry, but also poetry that lets them enter fantasy land. They learn about the different elements of poetry including imagery, metaphors, similes, rhyme, rhythm, repetition, and alliteration. The forms of poetry they are introduced to are narrative poems, free verse poems, and concrete poems. We are hoping that they will be able to relate the themes expressed in these poems to their own lives and to the world around them. On Friday, March 1, we celebrated Dr. Seuss’s birthday. This is always a fun day for the students, especially the younger ones. The students are allowed to wear PJ’s to school and we set aside a time in the afternoon for the older students to get together with the younger students and read Dr. Seuss books to them. My reading class looks forward to this especially if they have a younger sibling. You have to be careful here as the sizing isn’t consistent amongst manufacturers. Take a few of your child�s books to the store with you and load up the pack, to see if it will be comfortable. To do this I still put a large plastic bag in my backpack and pack everything in this.